Winter is the perfect season for enjoying a steaming bowl of homemade soup. 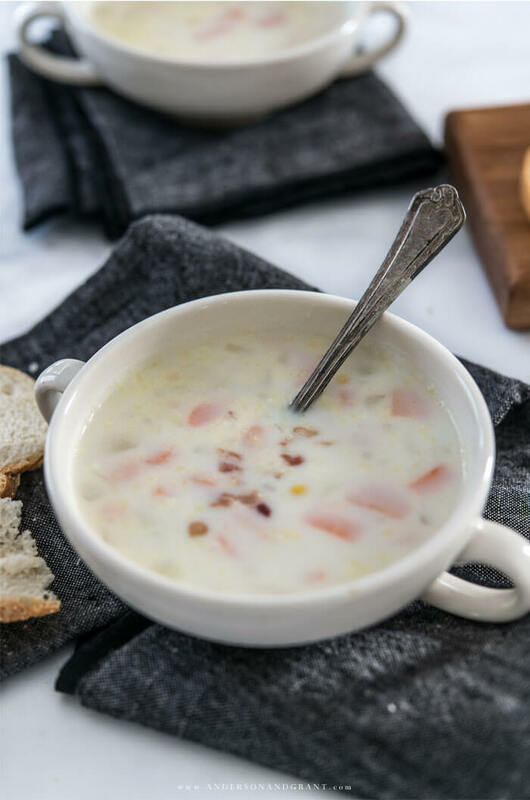 This recipe for Potato Corn Chowder is my go-to recipe for a quick and delicious supper. When winter hits, I crave a warm bowl of homemade soup for a simple supper. 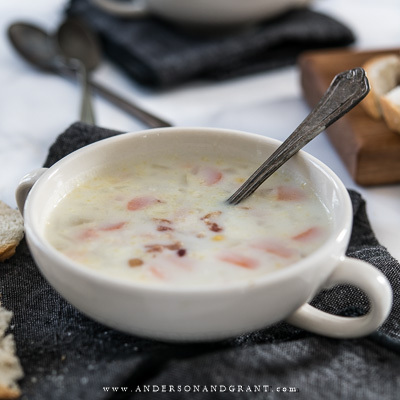 One of my all-time favorites is this Potato Corn Chowder and I make it quite often when the weather is cold. One reason why I love this recipe so much is because it is best made the night before and reheated saving all the time spent preparing when dinnertime rolls around. The chowder becomes thicker and more flavorful as it sits. Mealtime goes more smoothly anytime you can make something ahead or turn to the crock pot (like for this Creamy Chicken Noodle Soup) for supper. And it uses leftover mashed potatoes, which is one of those foods that I just don't enjoy eaten the second time around but hate to seen thrown away. Typically, whatever potatoes remain in the pan after a meal go into a container that is popped into the freezer until I've got enough to make the soup. Also, the recipe is just a general framework for the amount of ingredients and can be adapted for however whatever amount of potatoes you have. Double the recipe for a larger family. Cut it in half if it is just for yourself. Throw in more corn or less (which can also be leftover from that same mashed-potato-dinner). Top the chowder off with a little crumbled bacon and serve it with some fresh crusty bread. I love to keep some Real Bacon Bits around for recipes like this rather than having to cook it fresh. In no time at all, you'll have a delicious bowl of homemade soup to enjoy and warm you up on a cold day! Begin by chopping the carrot into small pieces and finely chop the onion. Add broth to a medium sized stockpot with the minced garlic and butter. Saute everything over medium heat until the carrots are tender and the onion is transparent, about seven minutes. Add the chicken stock to the pot. Then stir in the mashed potatoes and corn. Season with a little pepper. Bring the chowder to a boil and then turn down the heat and simmer uncovered for 25 minutes, stirring occasionally. The liquid will reduce and the soup will thicken as it simmers. Add the milk and simmer for an additional five minutes. 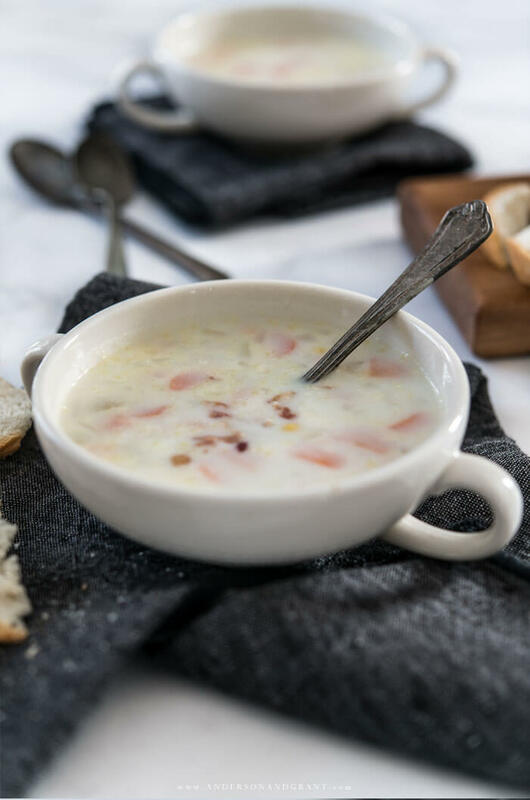 This chowder can be served immediately, but is best served reheated the next day as it will be thicker and more flavorful. Serve with a little crumbled bacon on the top. This post was originally published in January 2014.